Pika’s anguish and confusion are understandable. Though only 13, he has seen and done terrible things, and terrible things have been done to him. After Pika (Marc Pierre) flees the ranks of a rebel army, he finds refuge in a church occupied by a pair of 16-year-old girls, Adiel (Rachel Cognata) and Chris (Marge Dunn). Deeply in love, the girls have just exchanged marriage vows in a tender private ceremony. In doing so, they have each transgressed against the beliefs of the deeply conservative cultures they come from. Adiel is a resident of the township in Northern Uganda where the church is located, while Chris is the white daughter of an American missionary. The small, nondescript church where they profess their love for each other is dominated by a large, scuffed crucifix (the set design is by Jon Savage). Touched by the plight of Pika, who is being hunted by a gun-toting soldier (Michael Ofori), the girls offer the youth their assistance. As matters escalate, tragedy strikes, leaving more than one soul broken in “Cardboard Piano,’’ which is directed at New Rep in its New England premiere by Benny Sato Ambush. Although hobbled by a slow start, a couple of other static stretches, and a plot contrivance or two, “Cardboard Piano’’ still manages to achieve a potent resonance, due in no small part to the fact that the play focuses so intently, and laudably, on the destructive impact and lingering wounds caused by homophobia. Playwright Jung, who is from South Korea, has crafted a story that illustrates how bigoted attitudes, once instilled in the young, can function as weapons every bit as devastating as rifles, tearing through the social fabric and causing incalculable collateral damage. Astutely, she shows how that damage can capsize the lives of those who hold such attitudes as well as those who suffer from their consequences. Act Two leaps forward in time to 2014, when a pastor named Paul (Ofori) is celebrating a joyful wedding anniversary with his wife, Ruth (Cognata), playfully bantering with her in the same church where Act One unfolded. Eventually, a young gay man named Francis (Pierre) shows up, preceded by another person whose identity won’t be revealed here, and the connection between the two halves of “Cardboard Piano’’ slowly and wrenchingly comes into view. Though it must be said that the adult actors don’t really seem like teenagers in Act One, the performances are otherwise strong across the board. Cognata brings a subtly elusive quality to her portrayal of Adiel and an empathetic warmth to Ruth, a woman whose love for her husband is tested in ways she never could have imagined. A graduate of the Boston Arts Academy and Tufts University, Cognata further builds on an impressive track record that includes her performances in Company One Theatre’s “Hype Man: a break beat play’’ (2018) as a beat maker who joins a hip-hop group and in “Really’’ (2017) as a photographer trying to get at the truth of a boyfriend who is no longer in the picture. 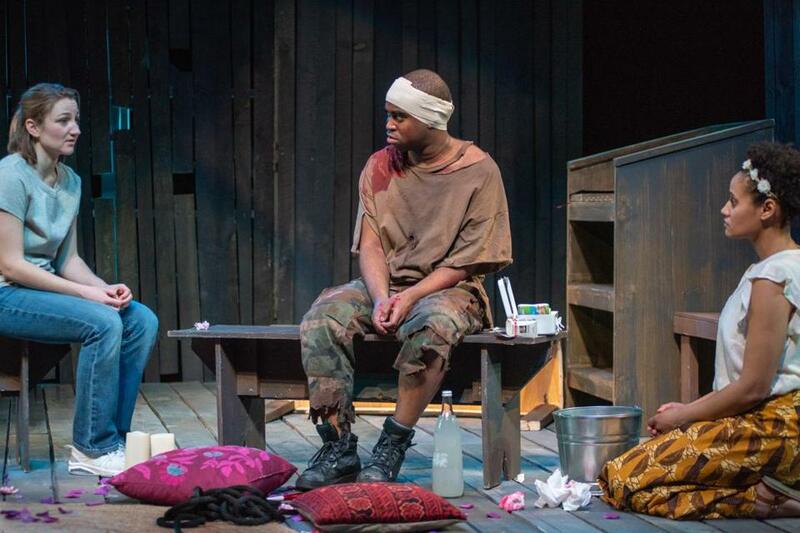 Pierre skillfully captures the desperate, lost quality of young Pika, while Ofori, who is originally from Ghana and appeared in New Rep’s 2018 production of Athol Fugard’s “Statements After an Arrest Under the Immorality Act,’’ conveys the rigidity, torment, and psychological complexity of pastor Paul. As Chris, Dunn impressively shifts among emotional registers, from happiness to fear to anger to the grief of one weighed down by the knowledge that some damaged souls cannot be repaired.